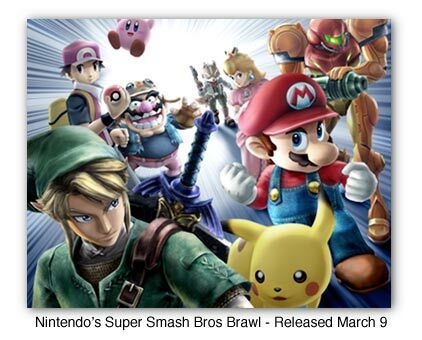 Nintendo is once again making a huge impact on the game market. Their Wii platform is a huge success and so is their portable DS platform. 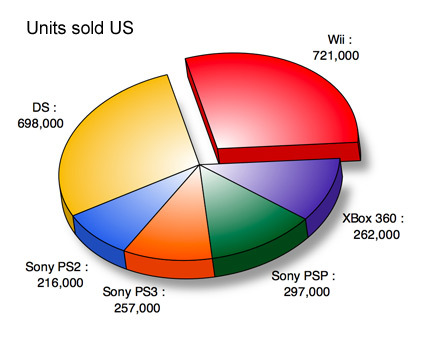 Both are outselling Sony’s playstation and XBox 360 by more than 2 to 1. Ars Technica also has a great article on how all the companies spin the numbers. The lights went on for me while standing in a long line with my two sons a few weeks ago. Video games are the new rock stars. We were standing outside a tiny game store in North Vancouver, hours before the mall opened, to pick up the newest Super Smash Bros game for Wii. The lineup wasn’t for the chance to buy the game – my oldest son had pre-ordered and paid for the game months earlier. The lineup was simply to pick up the game, as early as possible, on March 9th, the day it was released. For pretty much the same reasons people my age, who grew up in the 60’s and 70’s, lined up outside the record store to get the latest LP by a cool band. I could, and did, spend hours in the local record store, flipping through album after album. How much things have changed in one generation is striking. Today, even finding a record store is difficult. In the US alone, 2,700 record stores closed between 2003-2006. Some people are starting to speculate that video games could save the music industry. 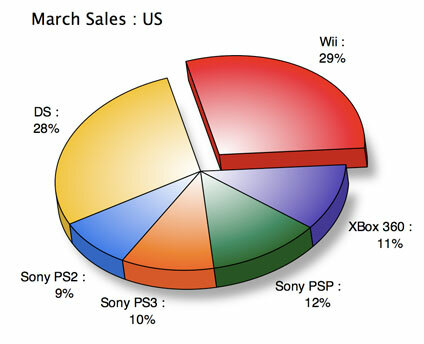 US video games sales have jumped 34 percent in February to 1.33 billion dollars. In their heyday, US-wide record sales were roughly 14 billion annually, according to RIAA figures. My kids have never been to a record store. They’ve never used a turntable. They have no idea what a double album is. They don’t even have audio CD’s. Their music is on their iPod – music is just files. But they have a lot more music at hand than I did at their age, and they’re aware of far more bands that I ever was. What I realized standing in line on March 9th is this: my kids’ relationship to video game is almost identical to my relationship to music growing up in the 60’s ad 70’s. Recent surveys show that two-thirds of parents are worred about their kids use of video games. One of the big fears parents identify with video games is how long their kids spend playing. But is this any different than it was in my day ? When Woodstock: Music from the Original Soundtrack and More first came out in 1970, I was 13. It was a three record set, and I could listen to it from start to finish, two or three times at a sitting. Years later, I recall my cousin Roland travelling from St. Boniface to visit me in Calgary. For the entire two weeks he stayed with me, he never once left my apartment. He never got to the rockies, never witnessed big sky country, or flirted with any big boned gals. Instead, he sat with headphone on, listening to my advance release copy of Pink Floyd’s The Wall, over and over and over. My parents were convinced that the music I listened to as a teenager was ushering in the demise of society as we know it. This wasn’t even a radical position. Rock music was responsible for teen pregnancy, vandalism, the F word, the decline of morals in general, and mine in particular. For a while, I stored a couple of crates of records that one of my friends wasn’t allowed to have in his house. His parents banned them from sight, fearing his imminent moral decay at the site of a big breasted woman on the cover of a Santana album. Instead of realizing that artists were reflecting the world the saw around them, many parents were convinced that lyrics, album art and ‘subliminal messages’ were leading us all into chaos. But how about a quick reality check. What was the lasting impact of all those artists who were intent on leading us on an irrevocable march into depravity ? This is a list of the top 10 selling artists the year I graduated high-school, 1974. These are the people my parents and all their friends feared would ruin my generation ? I suspect that in 35 years, when we look back at the rock stars of the day – the video games – we’ll wonder what all the fuss was about.